The Boot Insulator™ is ArcticShield’s® debut product that introduced sportsmen to a whole new world of warmth and comfort. When you're in cold weather and can't move around, your feet will eventually make you pay for it by ending your day early. How many times have you wanted to stay out hunting but gave up because your feet were just too cold? With ArcticShield’s® Boot Insulators™ you can stay out longer – increasing your chances for success – while staying comfortable and warm. 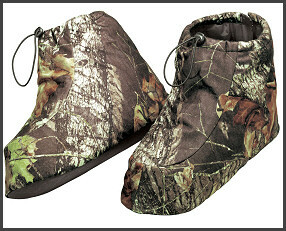 Simply slip these high-efficiency Boot Insulators™ over your boots or shoes once you reach your destination; they will provide your feet with all the warmth they will need. Now you can wear lighter, more comfortable boots or shoes while remaining warm all day in the field. ArcticShield’s® Boot Insulators™ are compact; they roll up easily and will fit in most coat pockets. Each insulator only weighs 8 ounces and is water resistant. Redesigned in 2004, the Boot Insulators™ are now better than ever. The new design has moved the shoe entry to the rear with a quiet YKK zipper closure for easier application.